Looking at the year in sports for 2014, Canada made its mark in tennis and basketball while confirming its dominance in Olympic hockey. Outstanding individual performances and teams coming together to achieve greatness marked the year 2014. Canada has firmly put itself on the tennis map with the emergence of top-10 stars Milos Raonic and Eugenie Bouchard. They solidified their status as part of the game’s elite by qualifying for their respective year-end championships and reaching personal milestones at the grand slams. Raonic, from Thornhill, Ontario, has been a top-20 player for nearly three years now, but 2014 was the year he cemented himself in the top 10. He reached a career high ranking of No. 6 and finished the year ranked No. 8. His biggest achievements include qualifying for the exclusive ATP Tour Finals in London and reaching the Wimbledon semifinal—his best showing at a major. Raonic, 23, also recorded his first win against Roger Federer with a scintillating performance at the Masters 1000 event in Paris. For Bouchard, 2014 was a monumental year in which she skyrocketed up the rankings to finish at No. 7. She did reach as high as No. 5. Bouchard, from Montreal, got to the Wimbledon final and semis of the French and Australian Opens in only her second year competing in the majors. The 20-year-old became the highest ranked Canadian in WTA history (passing Carling Bassett-Seguso) when she became the first Canadian woman to reach a grand slam singles final. Canadian tennis is in good hands with Raonic and Bouchard and 2015 could be the year one of them wins a major. 2014 was a massive year for basketball in Canada with the Toronto Raptors reaching the playoffs and the nation (or at least the Greater Toronto Area) making a statement at the NBA draft. The Raptors have surged to the top of the NBA’s Eastern Conference to start the 2014-15 season after their playoff appearance earlier this year. Toronto lost in Game 7 by one point to Brooklyn after leading the best-of-seven series 3–2 in last season’s playoffs. The Raptors reached the NBA postseason in 2014 after five straight seasons of missing out. And they had the Toronto sports landscape pretty much all to themselves after the Toronto Maple Leafs failed to make the NHL playoffs. Perhaps the balance of power between hockey and basketball is shifting in Canada’s biggest city. A big seven-player deal to send Rudy Gay to Sacramento last December allowed DeMar DeRozan the chance to flourish in the Raptors’ lineup. He finished the season with his highest points per game total (22.7) in his career. Now DeRozan and Kyle Lowry are the driving force on a squad that aims to go a long way in the playoffs this year. Canada, and especially the GTA, bore serious fruit in the 2014 NBA draft. Nineteen-year-old Andrew Wiggins from Vaughan was drafted first overall, Nick Stauskas from Mississauga went eighth, and Tyler Ennis, from Brampton went 18th. Canada now has the second most players in the NBA overtaking France. In a repeat of Vancouver 2010, the Canadian men and women brought home golds, but this time, it was the women providing the heart-stopping moments. For the men, Carey Price cleared up any goaltending confusion, finishing the tournament with a .971 save percentage. He had an outstanding defense corps in front of him, which helped him post shutouts in the semifinal over USA and final over Sweden. The Canadian men dominated from start to finish. They never trailed in any of their games led by their defense. Drew Doughty led all Canadian scorers with four goals and two assists. In the women’s tournament, it was always going to come down to Canada or the U.S. for gold. Canada beat the U.S. 3–2 in the preliminary round and then the two nations worked their way to the final. Other than facing each other, both the U.S. and Canada won all their games by at least two goals. The women’s gold medal game was the match of the tournament. USA had a 2–0 lead early in the third period, but Canada evened it up with 55 seconds left to play courtesy of Marie-Philip Poulin. And just over eight minutes into overtime, she scored on the power play to win gold for Canada. 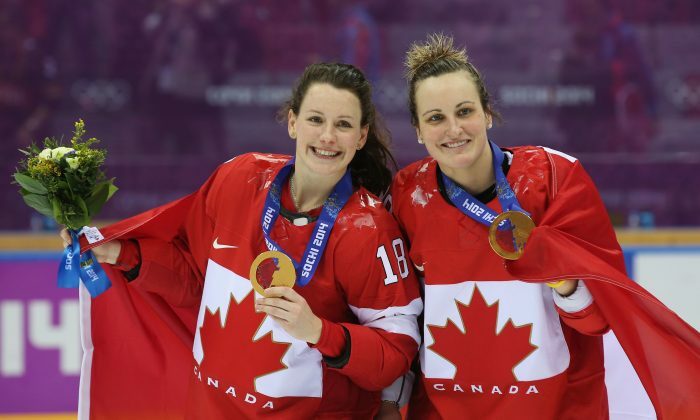 It was grand larceny on the Olympic stage, but it marked the fourth straight gold medal for Canada at the Olympics in women’s hockey. Looking ahead to 2015, Canada has a chance to make a mark on the world stage in soccer. With the women’s World Cup to be held in six cities across the country, Canada is taking a leading role in women’s soccer. The women’s national team faces a tricky start in the tournament that should capture the attention of the nation for the best part of a month next summer. International men’s soccer will reach out to Canada (Toronto) for the first time with the Gold Cup, the CONCACAF (North, Central America, and Caribbean) region’s premier event. To start the year, we’ll see if Canada can get back to winning gold in junior hockey—something it hasn’t done in five years (after winning five straight golds). The tournament is being hosted by Toronto and Montreal. Canada convincingly won their second straight Olympic gold medal in men’s ice hockey after beating Sweden 3–0 at the Bolshoy Ice Dome in Sochi, Russia on Sunday. What a week in Paris it’s been for Milos Raonic.